I'm dead serious: someone somewhere needs to send me a crappy book so I don't look like a free 5 star giver. I don't know if I am too easy on books, am not critical enough, or I just somehow get excellent books all the time. 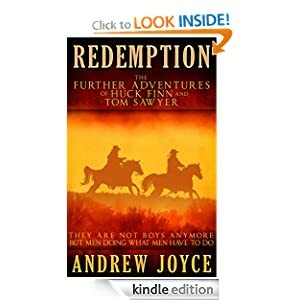 Well Redemption (as seen on the beautiful cover) is the added tales of excellent classic characters Huck Finn and Tom Sawyer. Now older, better writers, and more mature they go from the Confederate army to different paths ultimately to meet up in Redemption, Colorado for 1 goal. Book sound amazing? Well probably because it is. From the cover to the story the book was amazing. It flowed well, it read easily, and I loved the angle it came from. The book came alive, but felt more than a typical Western novel. It had a really good story to it and felt like a true Mark Twain story. It just felt so authentic I forgot Mark Twain has been dead a LONG time. 5/5 Really loved the book and couldn't fine one thing wrong with it! I'm sorry people that I haven't been on some epic rant about why a book is bad because well authors are churning out great content.